Gateway Manado -- With direct jet service provided by award-winning Singapore Airlines, Manado is the perfect jumping off point for North Sulawesi's diverse diving adventures. You don't have to choose between the amazing critter diving of Lembeh Strait, versus the blue water, schooling fishes, and soft corals of Bunaken Marine Park, Bangka Island, and Gangga Island. With Island Dreams new combo packages, now you can truly have it all. Lembeh Resort -- Lembeh Resort offers comfortable and spacious accommodations for visitors in an idyllic location overlooking Lembeh Strait. 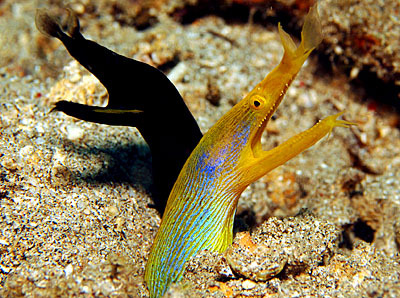 Based on our experience, the in-house dive operation, Critters@Lembeh, is the finest in the region. For a truly exceptional experience in a relaxed and professional atmosphere, Lembeh Resort is a superb choice. 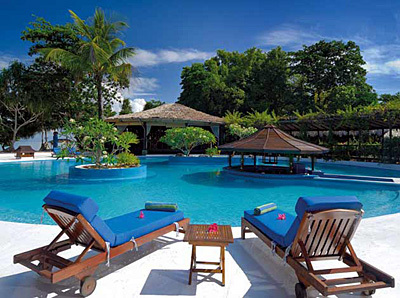 Siladen Resort & Spa -- At Siladen Resort & Spa you will enjoy an exclusive and memorable diving experience. Thanks to its strategic location in the heart of the Marine Park, and the in-house PADI diving center, 40 premium dive sites are within easy reach of the Resort. When not diving, you will enjoy gorgeous views, fine dining, and optional spa treatments. Flight Schedules -- Jet service between Singapore and Manado currently operates Monday, Wednesday, Friday, and Saturday on award-winning Singapore Airlines, and its subsidiary Silk Air. In addition to week-long stays at a single dive resort, this enables combination packages combining two (or three) resorts all in the Manado/Lembeh area. Lembeh & Bunaken Combination Packages: Island Dreams customized combo packages include all transfers forward from Manado International Airport, lodging and diving as indicated, hotel taxes, and three meals daily. Lodging is based on the Cottage room category at Lembeh Resort, and your choice of Garden View or Ocean View at Siladen Resort. Drinks, souvenirs, rental equipment, etc. are at the guest's additional expense, as is airfare to Manado. Prices are per person based on double or single occupancy. Prices and inclusions are subject to change. Combination packages include round-trip airport/hotel transfers, three (3) meals daily, and boat diving as indicated. Pricing based on choice of Garden or Beach room at Siladen. All packages use the Cottage room category at Lembeh Resort. Prices are per person, based on double occupancy, include hotel taxes, and are subject to change. Package inclusions are subject to change. No refund for unused portion of packages. The Bottom Line - These combination packages offer great value and quality, along with the best of Manado's diving. 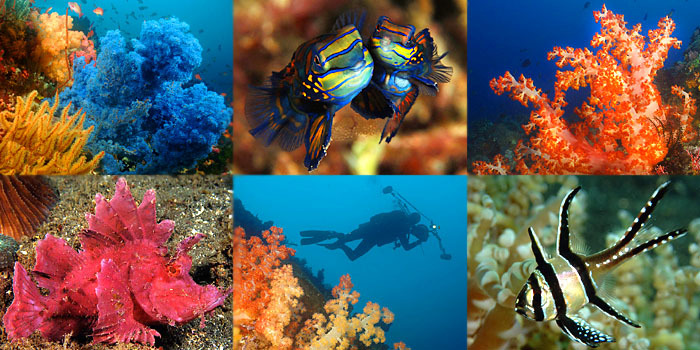 By visiting both Lembeh Strait and Bunaken, you enjoy the best of both diving worlds. Contact Island Dreams for complete details and current availability. We look forward to the pleasure of serving you. Island Dreams will create a custom Indonesia itinerary offering you maximum diving value, plus the option of rewarding topside touring to Bali and beyond. A wide variety of diving and touring options can be customized to suit your taste, budget, and time constraints. Contact the adventure experts at Island Dreams for complete details. Group Dive Tours to Indonesia -- Join us!